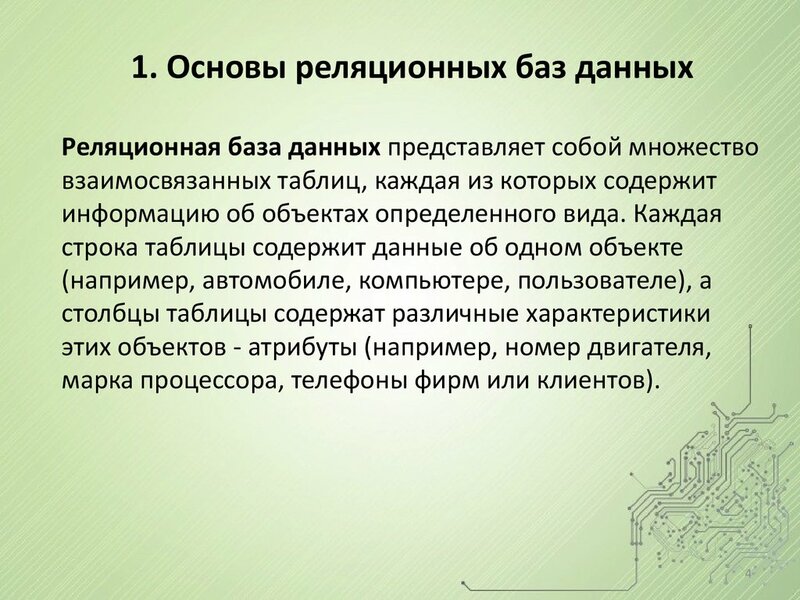 в целом, так и любой ее части. 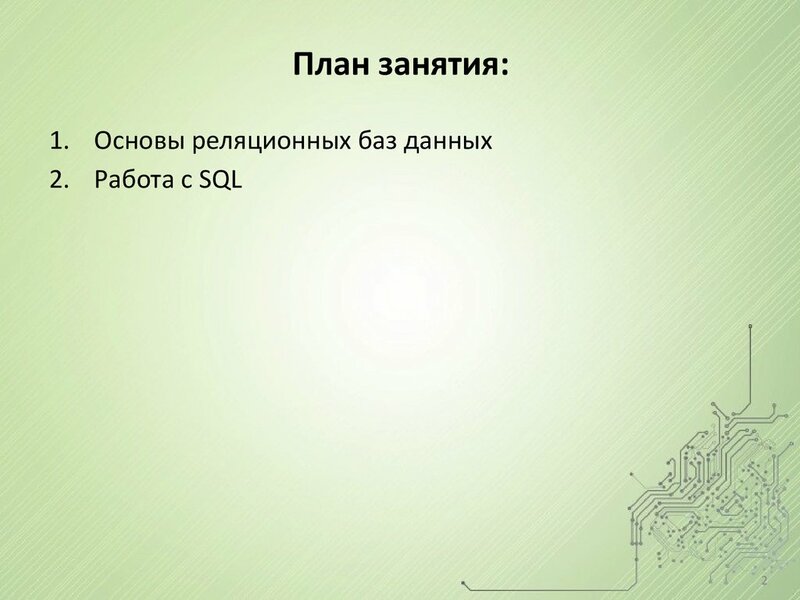 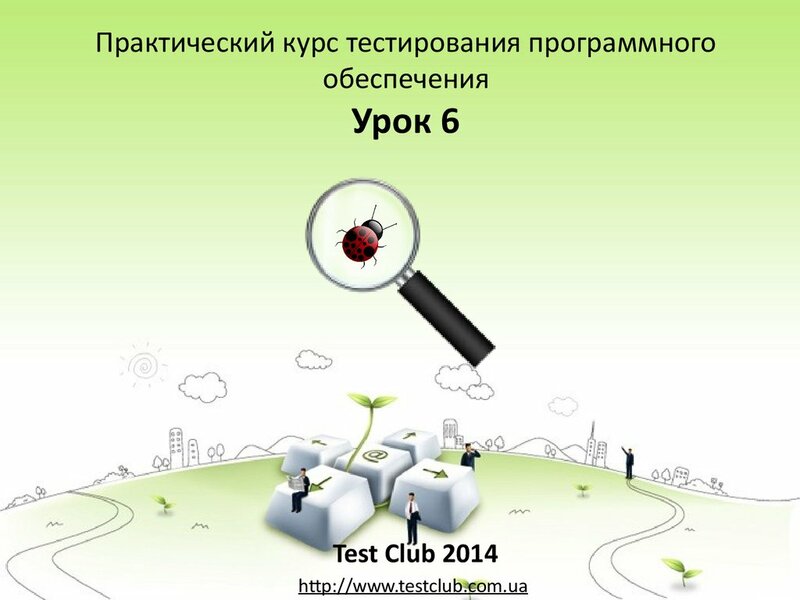 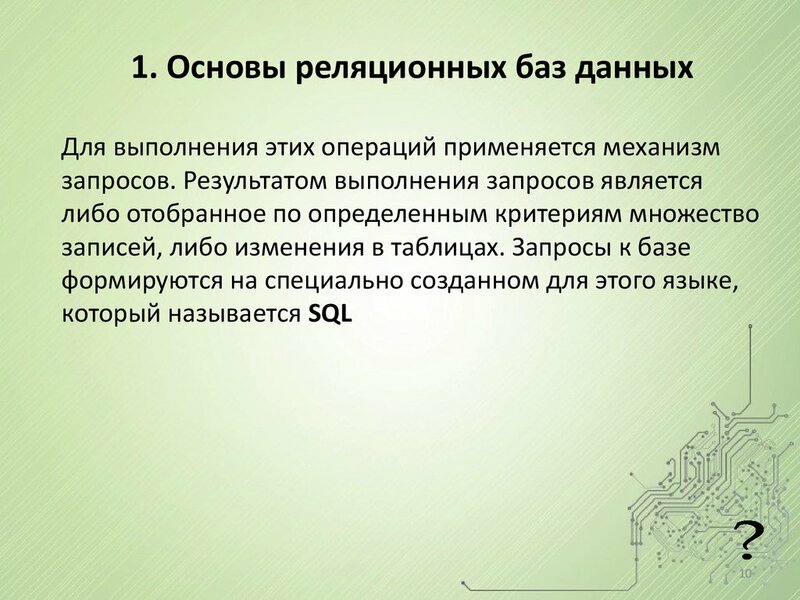 Другими словами это хранилище данных. 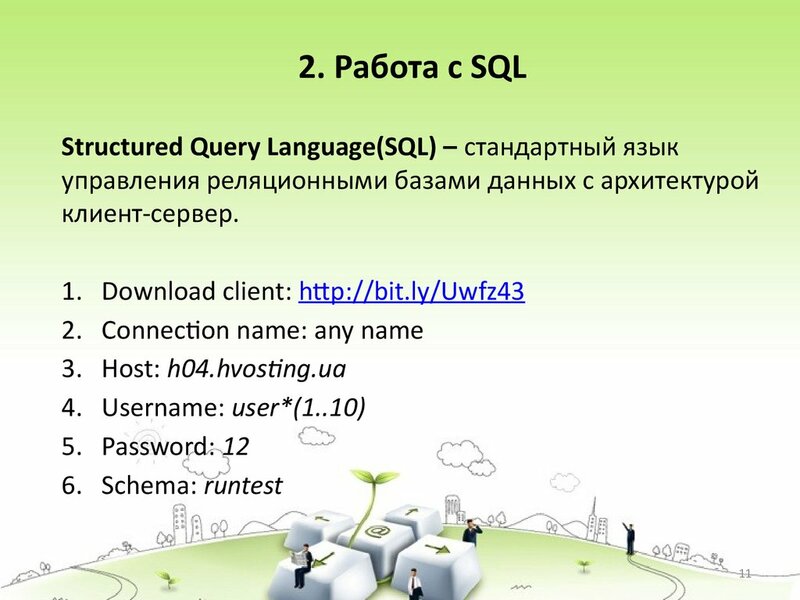 марка процессора, телефоны фирм или клиентов). 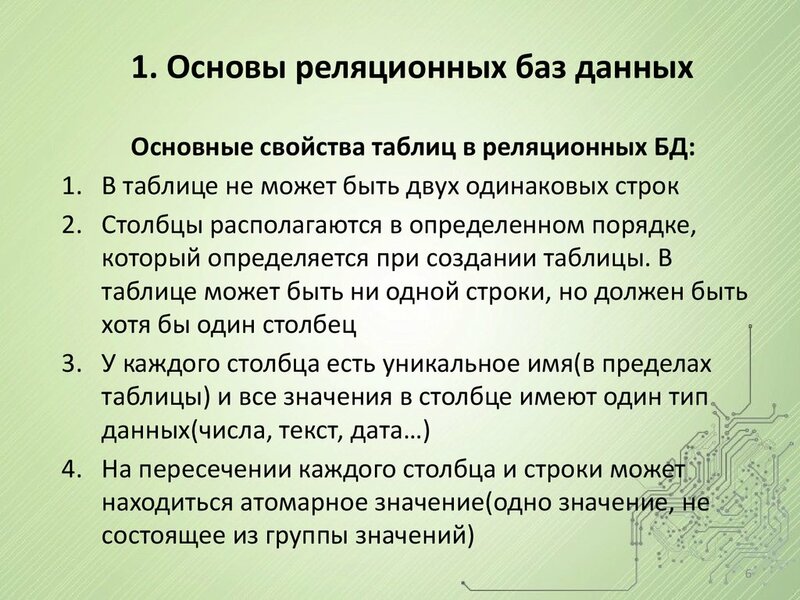 менять, удалять; обеспечивают безопасность и т.д. 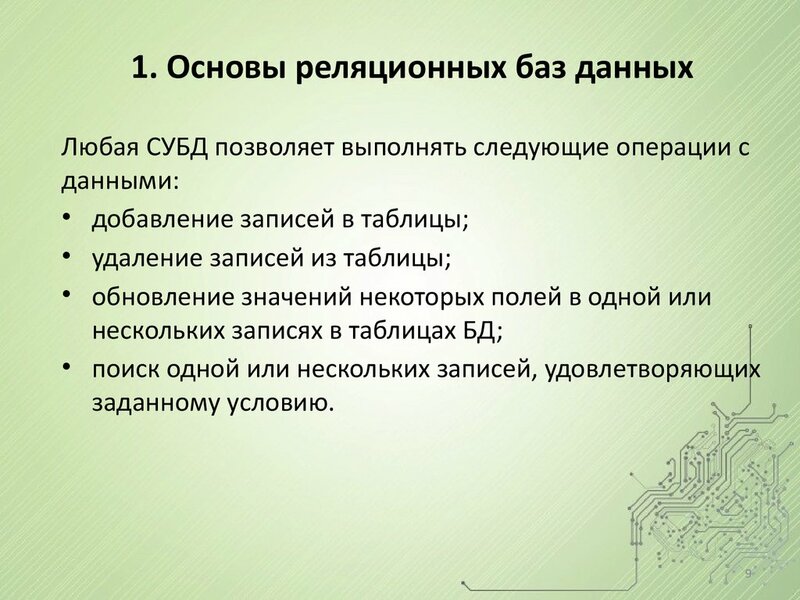 базы данных и манипулировать сведениями из них. 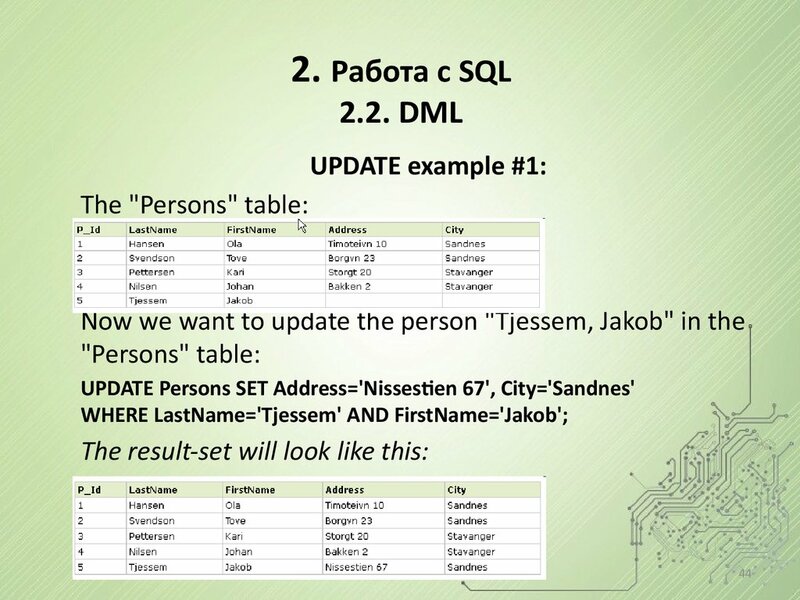 table is identified by a name (e.g. ”Persons" or "Orders"). 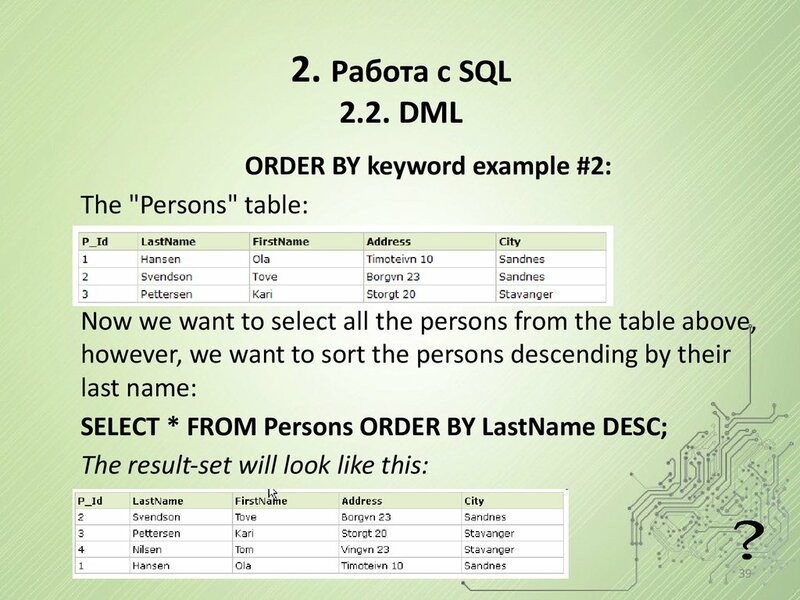 "LastName" and "FirstName" from the table above. 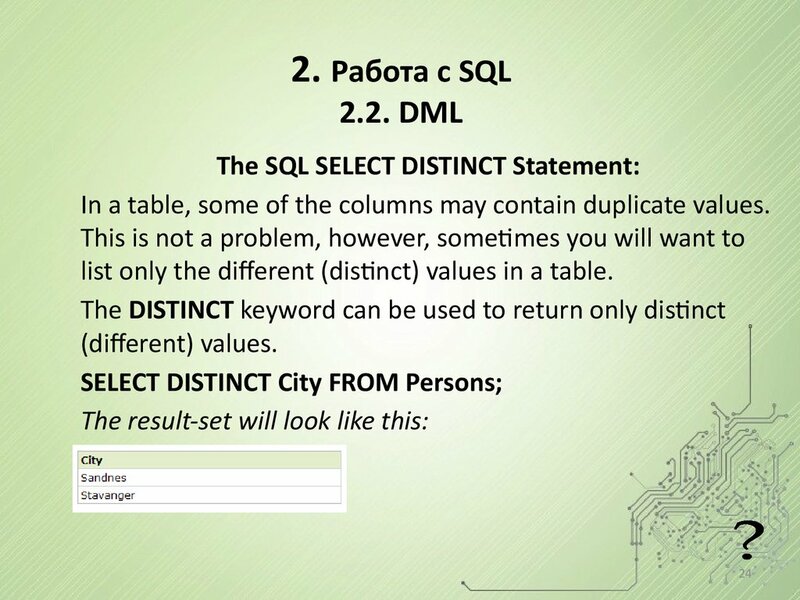 In a table, some of the columns may contain duplicate values. 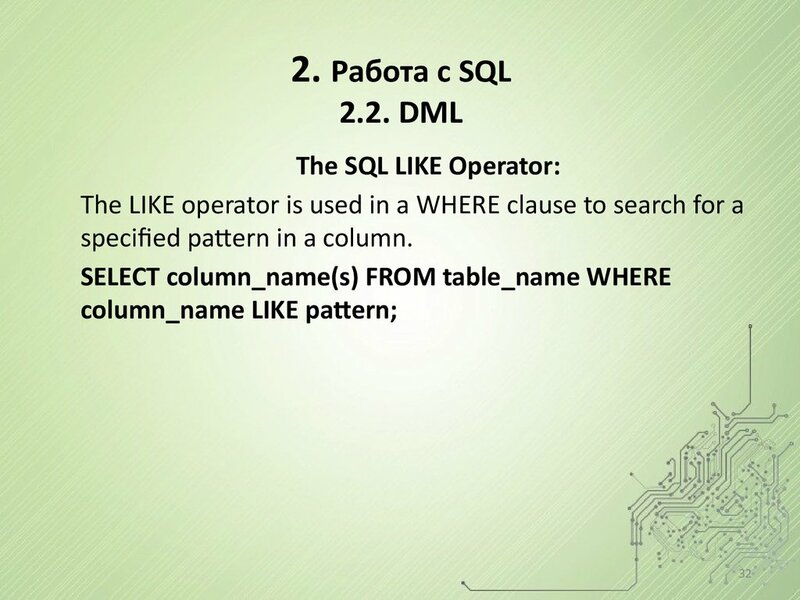 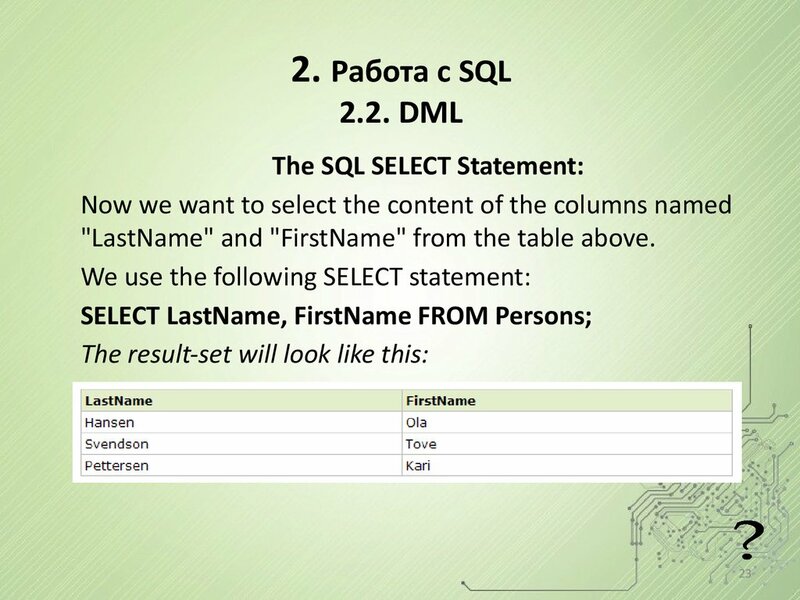 SQL uses single quotes around text values. 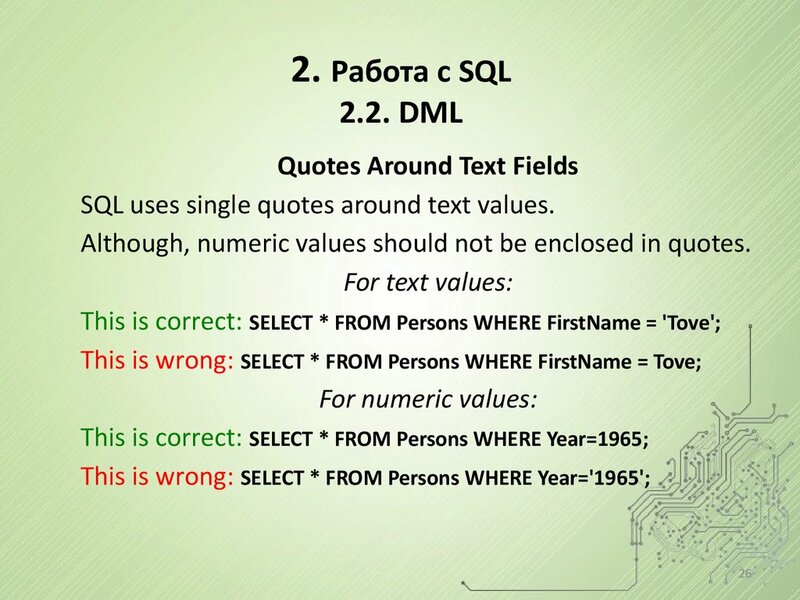 Although, numeric values should not be enclosed in quotes. 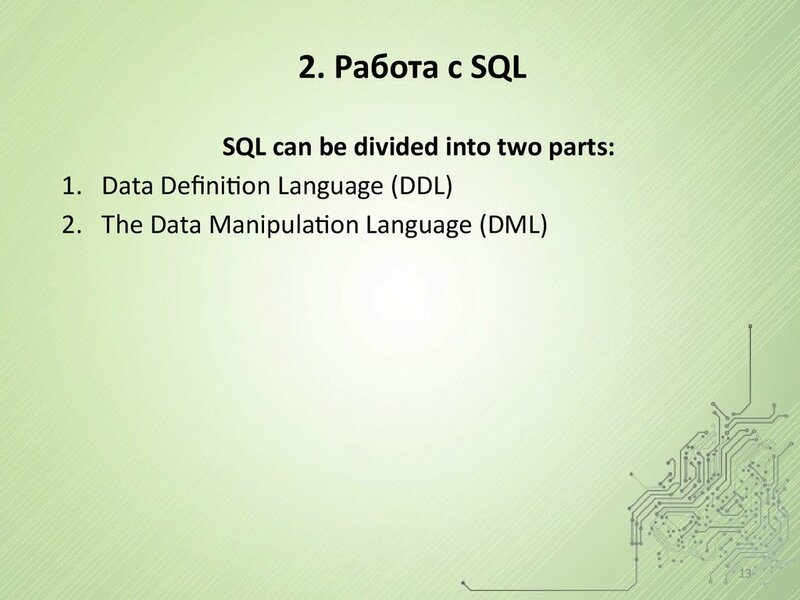 and the second condition are true. 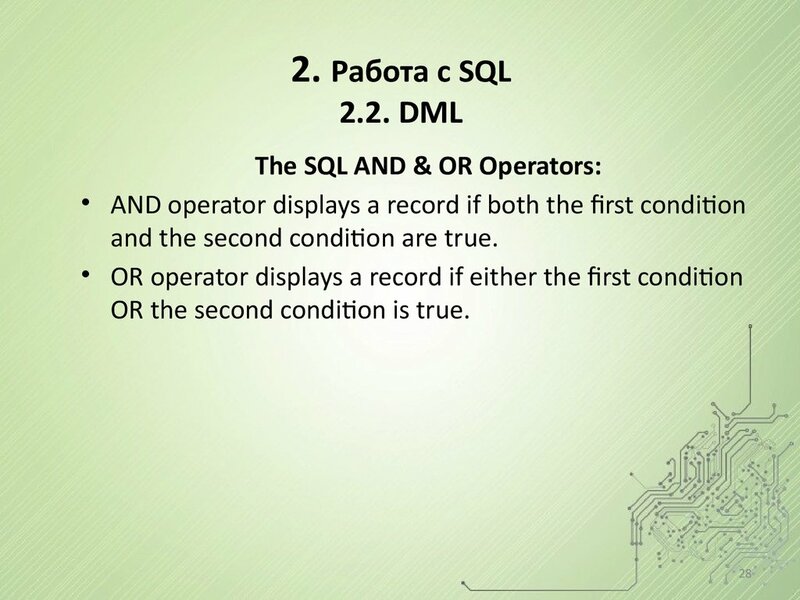 OR the second condition is true. 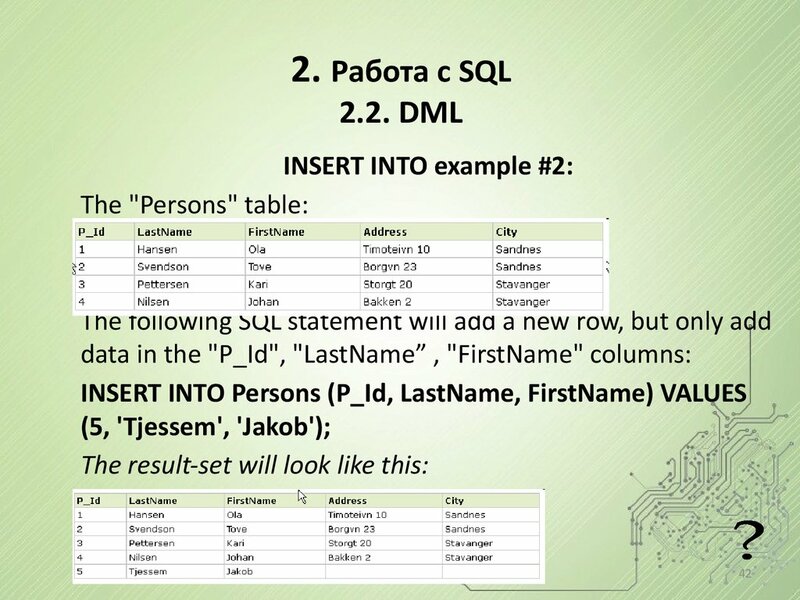 specified pattern in a column. 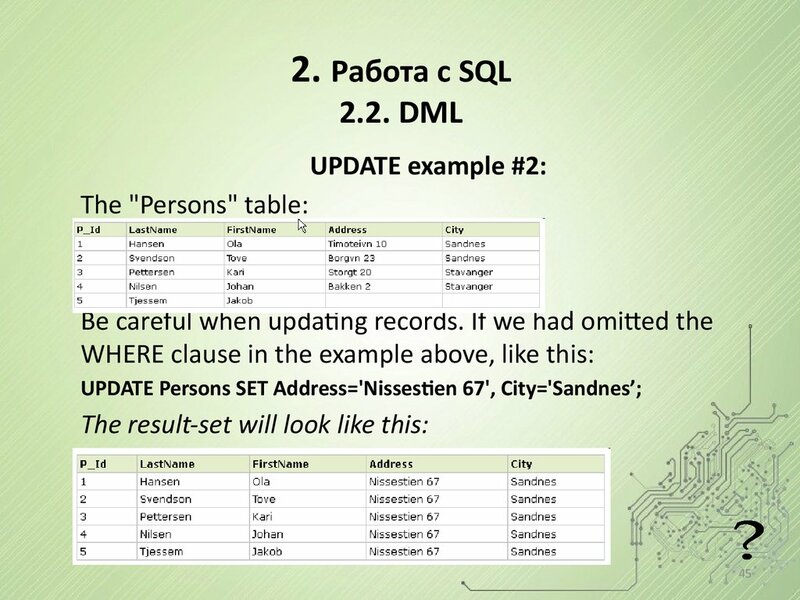 updated. 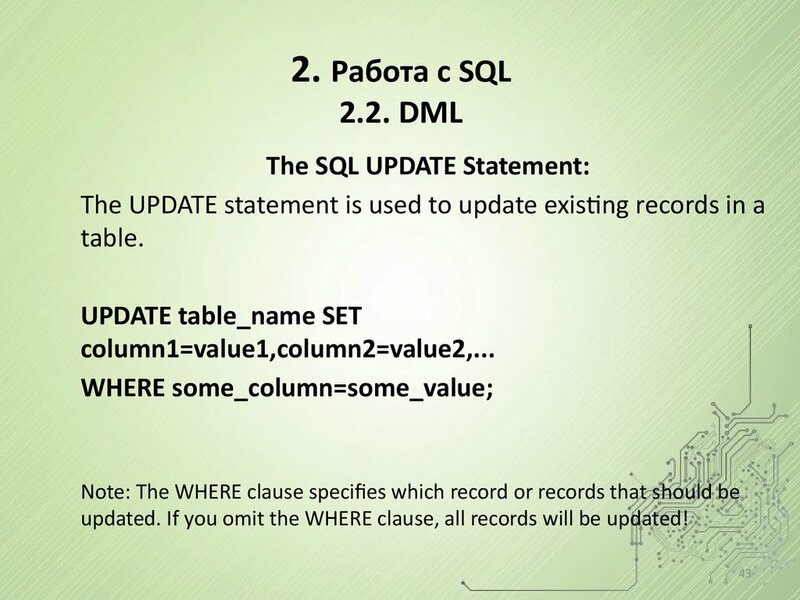 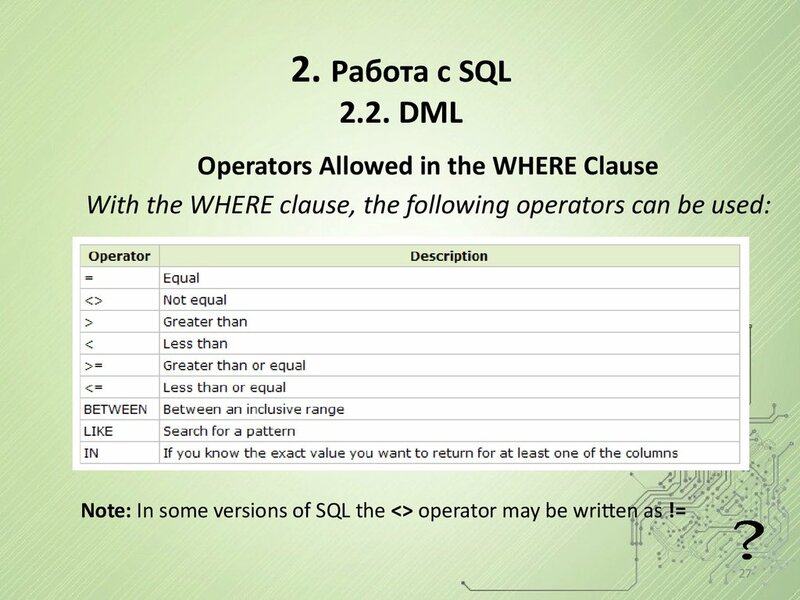 If you omit the WHERE clause, all records will be updated! 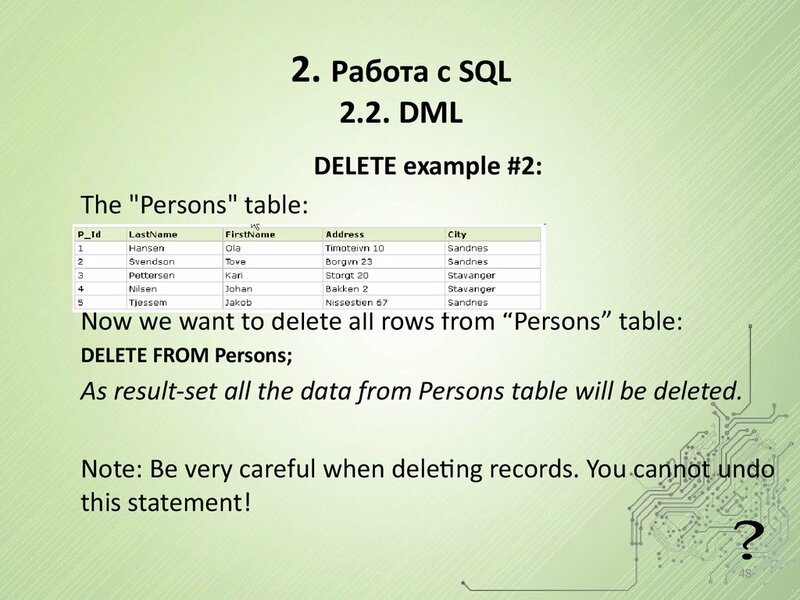 deleted. 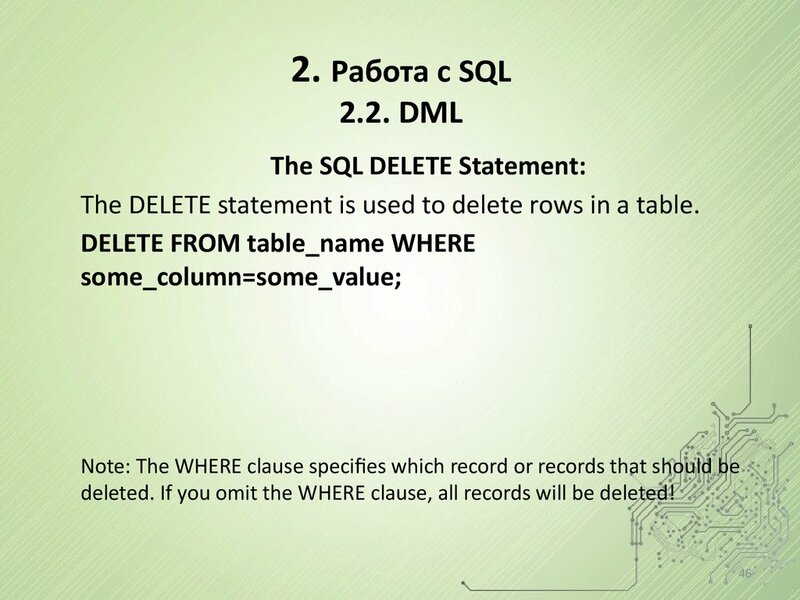 If you omit the WHERE clause, all records will be deleted! 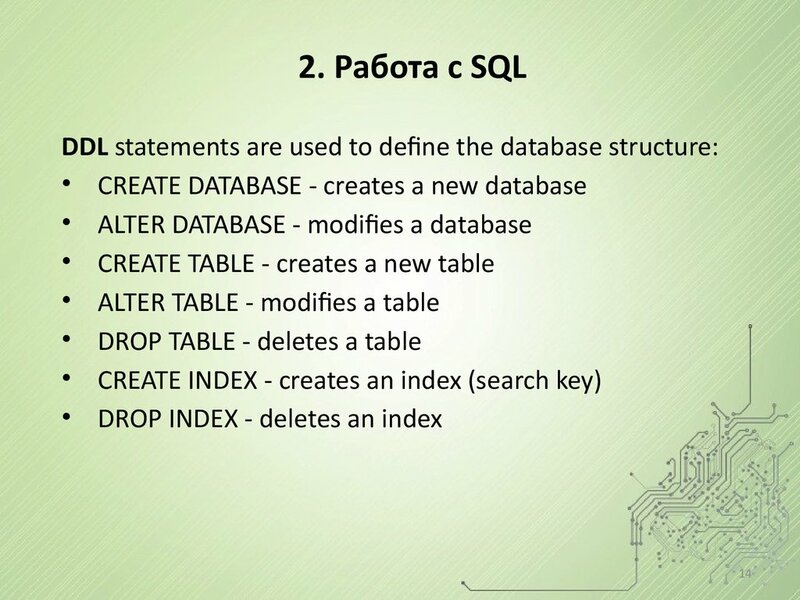 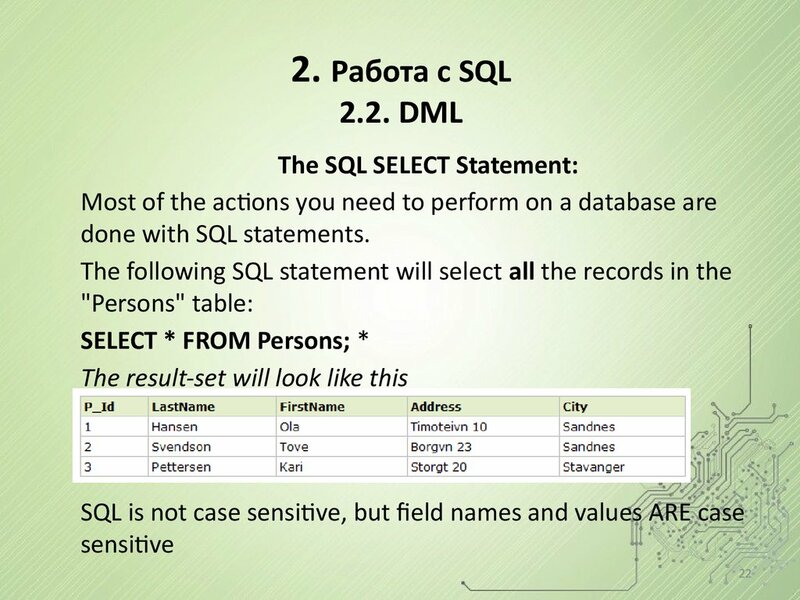 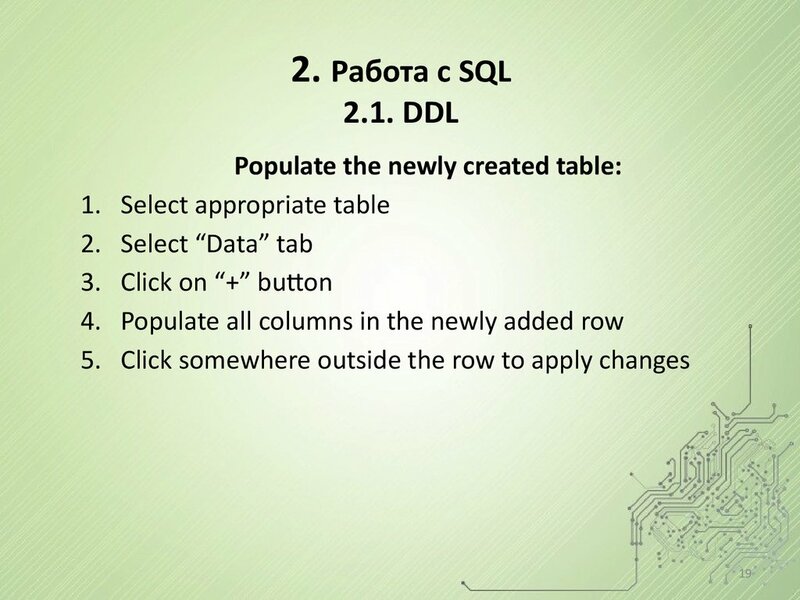 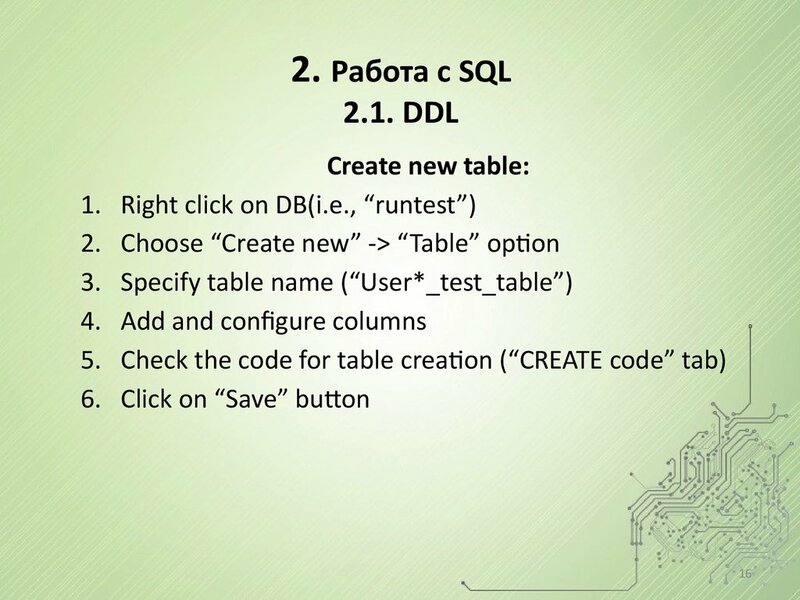 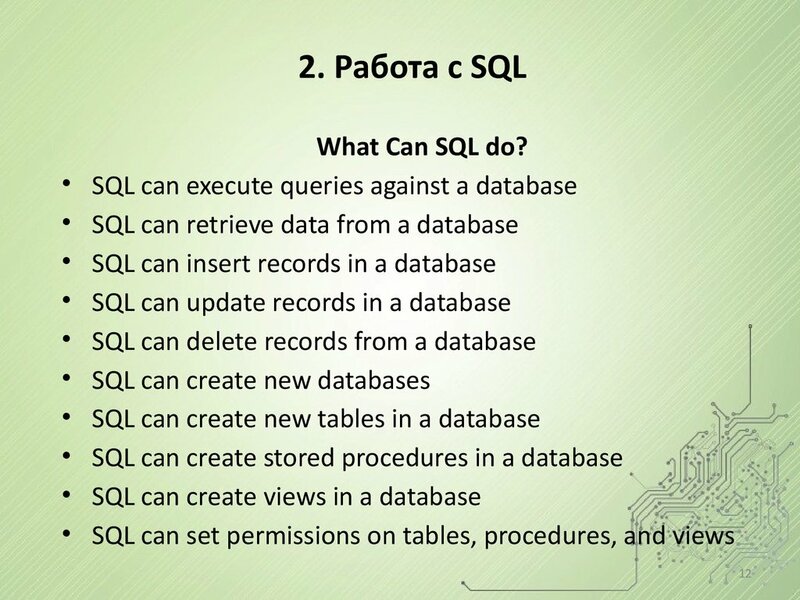 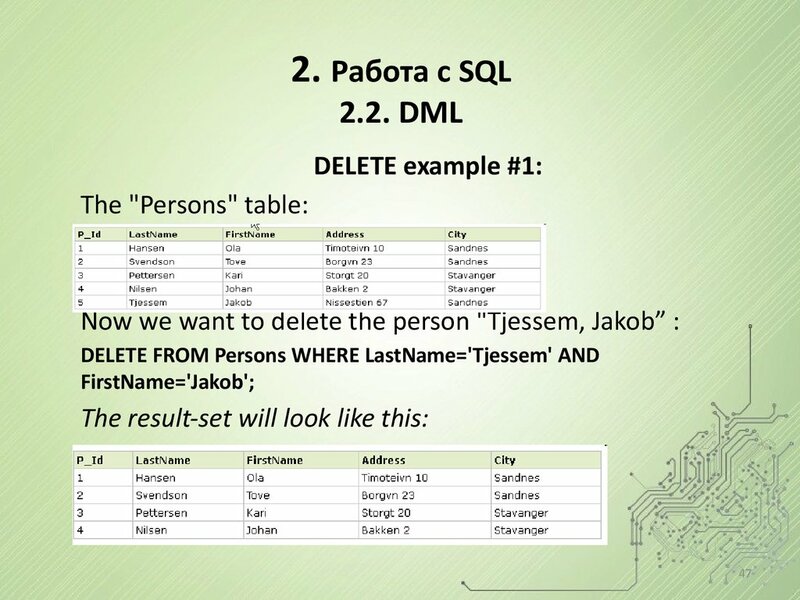 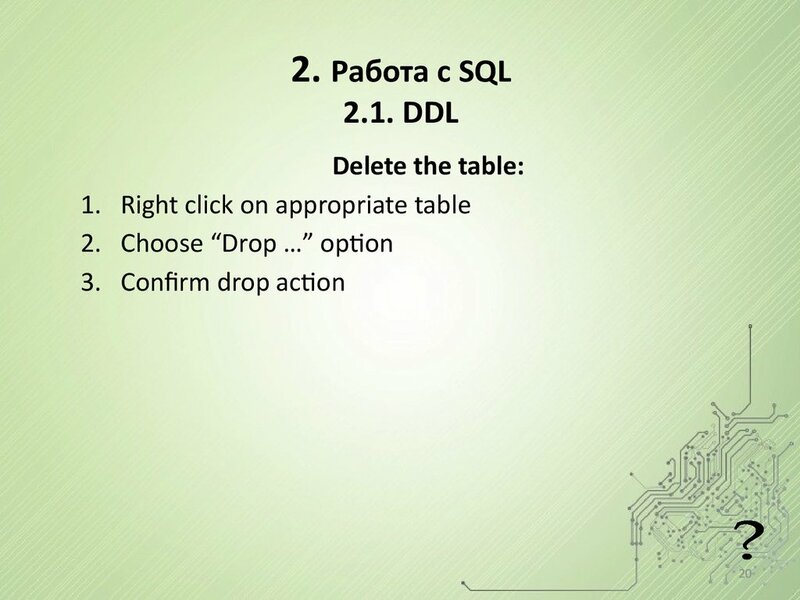 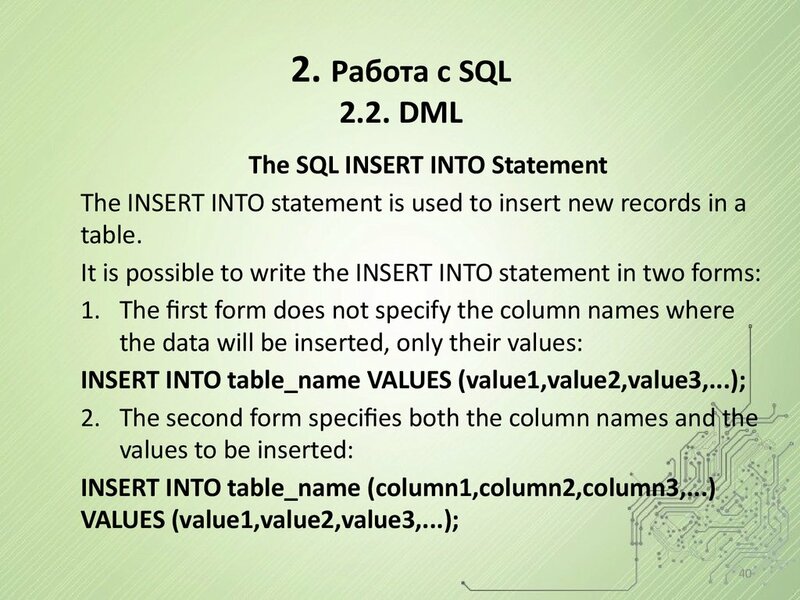 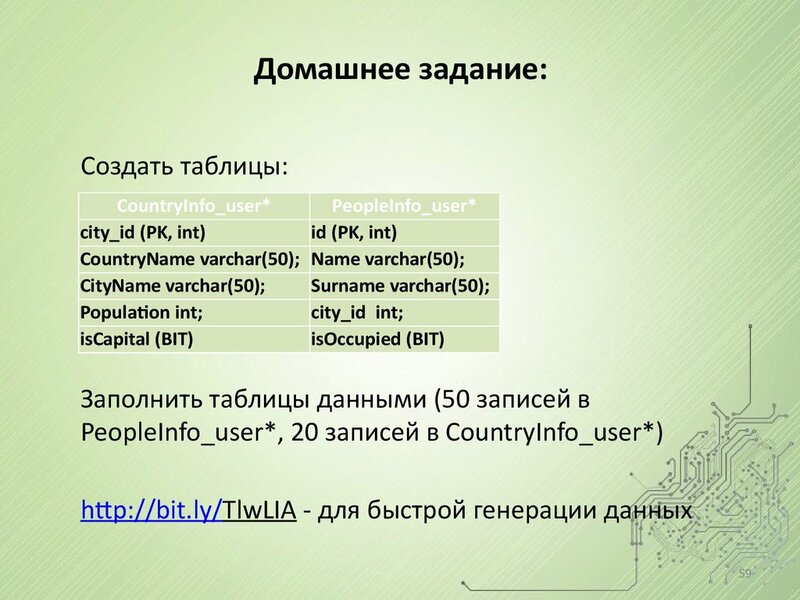 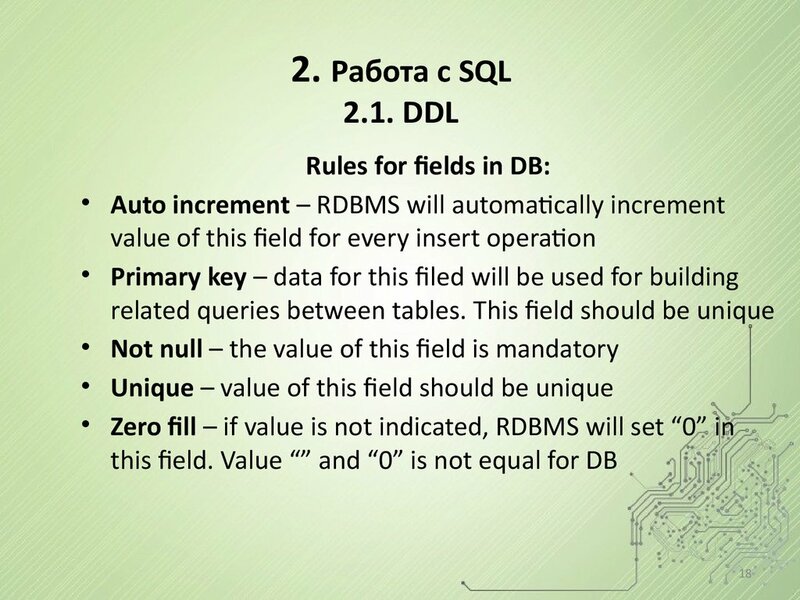 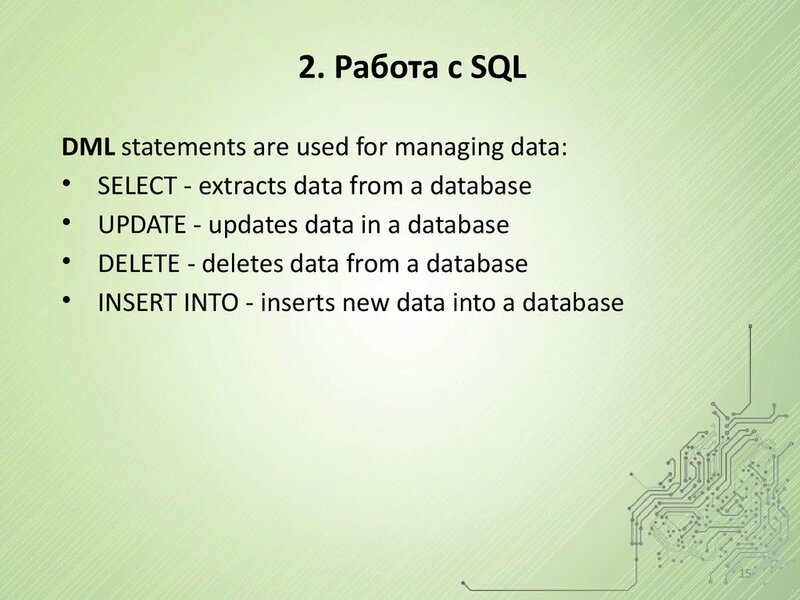 As result-set all the data from Persons table will be deleted. 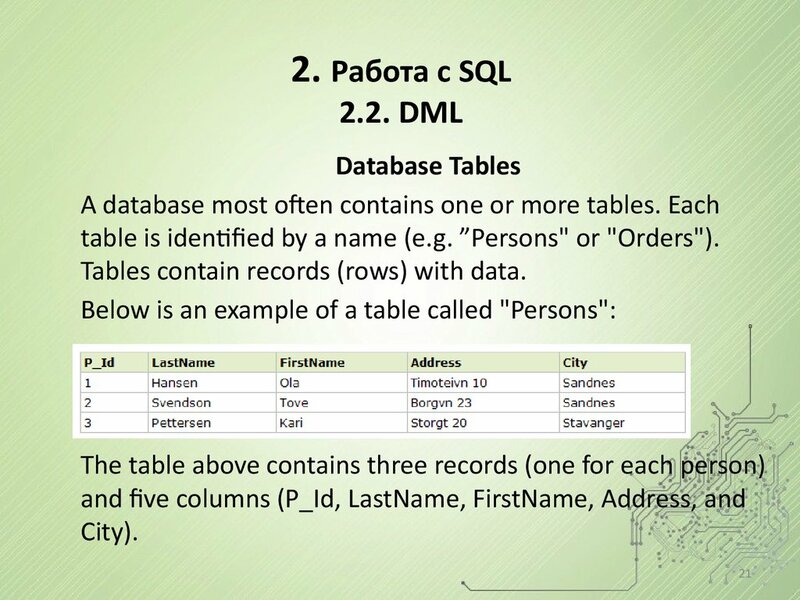 repeating all of the data in every table. 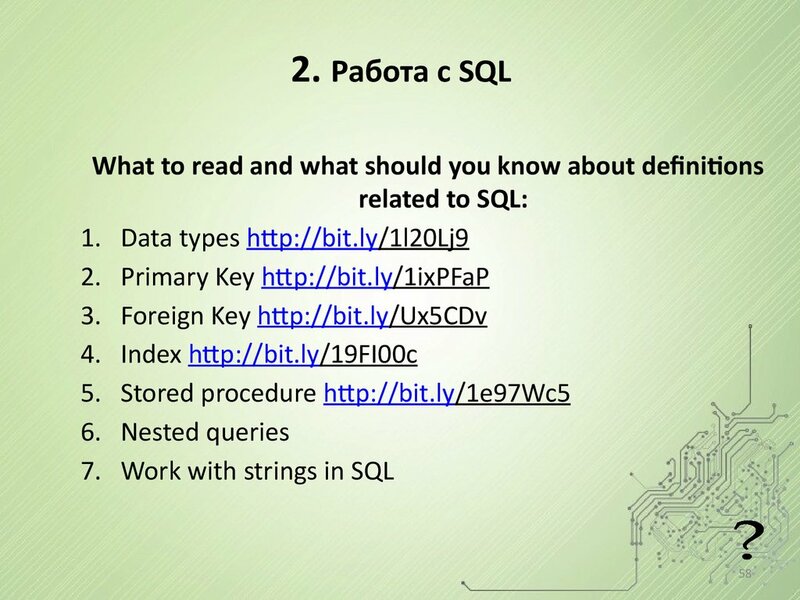 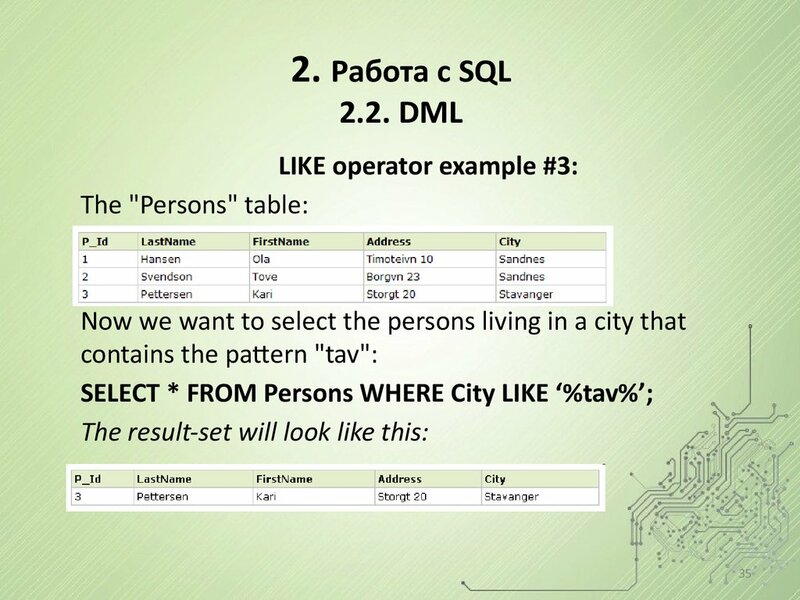 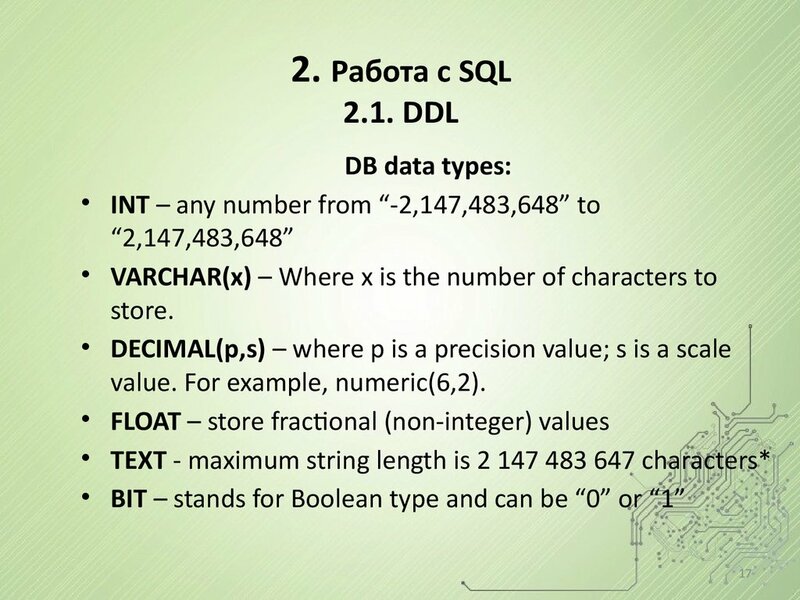 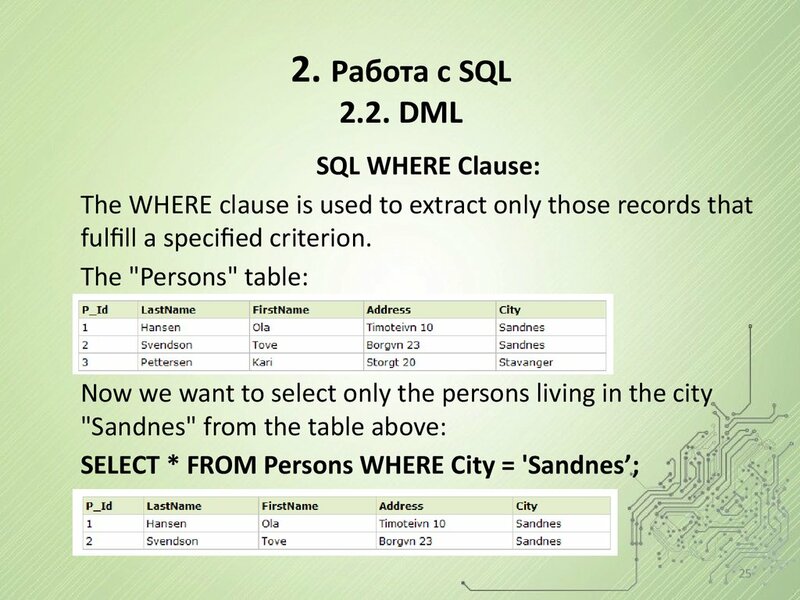 Note: "P_Id" is the primary key in the "Persons" table. 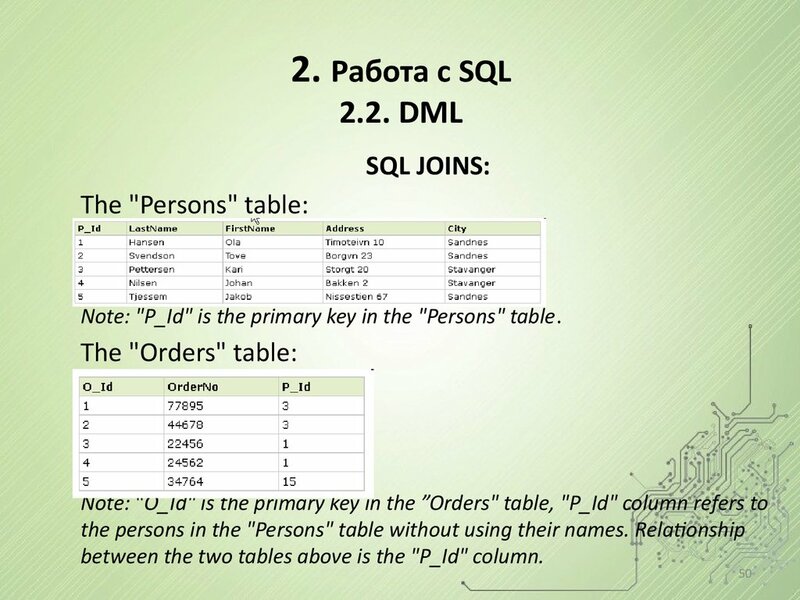 between the two tables above is the "P_Id" column. 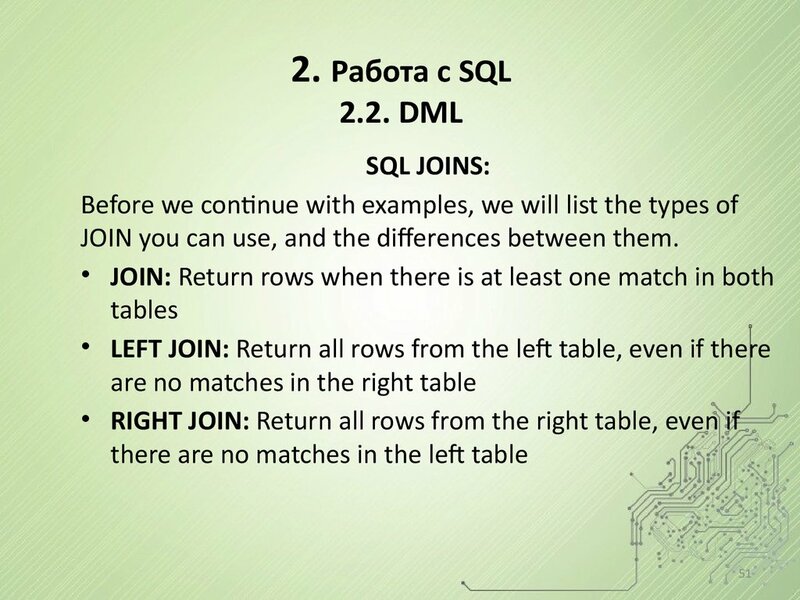 JOIN you can use, and the differences between them. 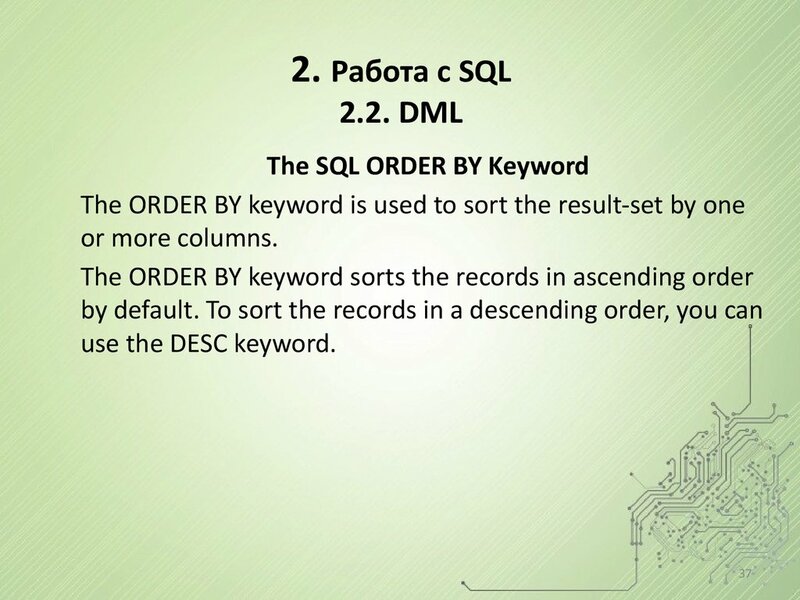 "Orders", those rows will NOT be listed. 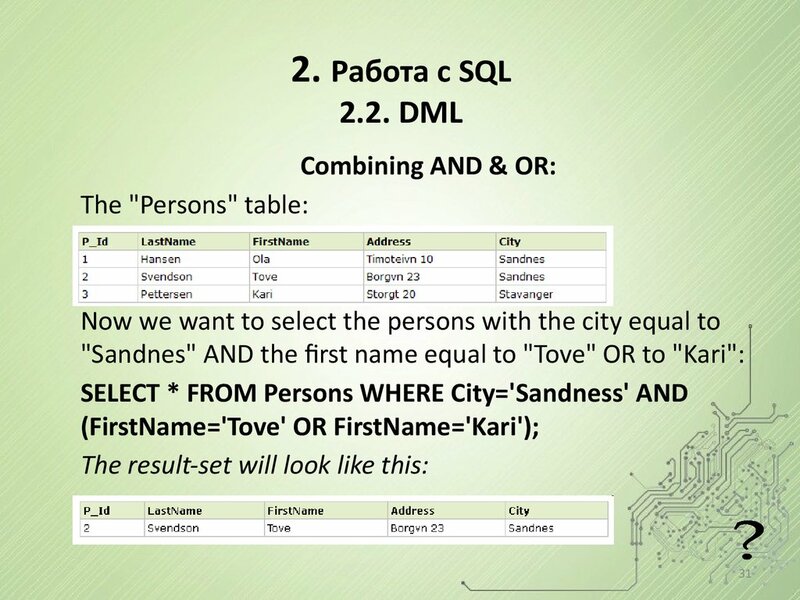 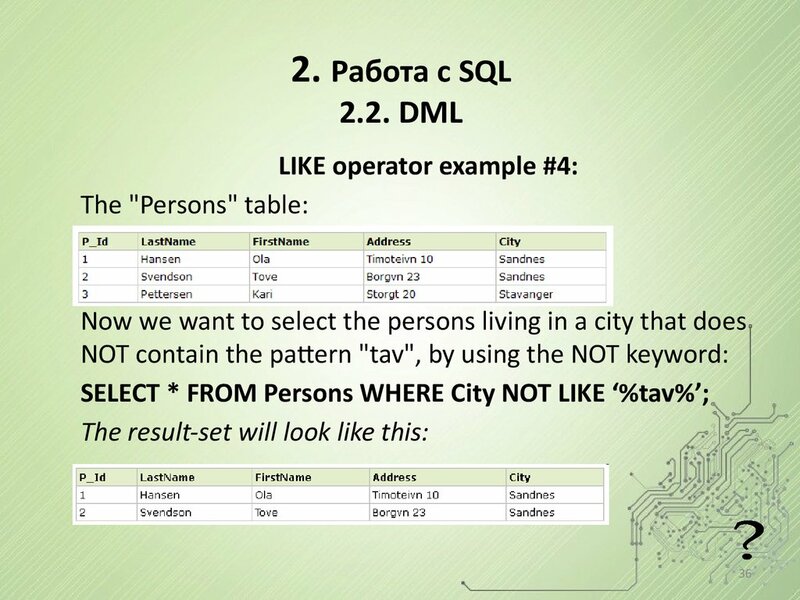 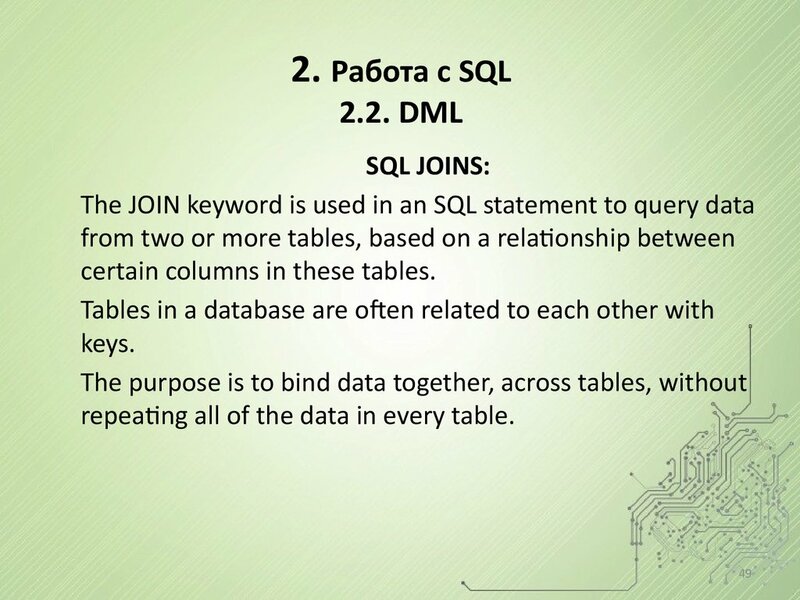 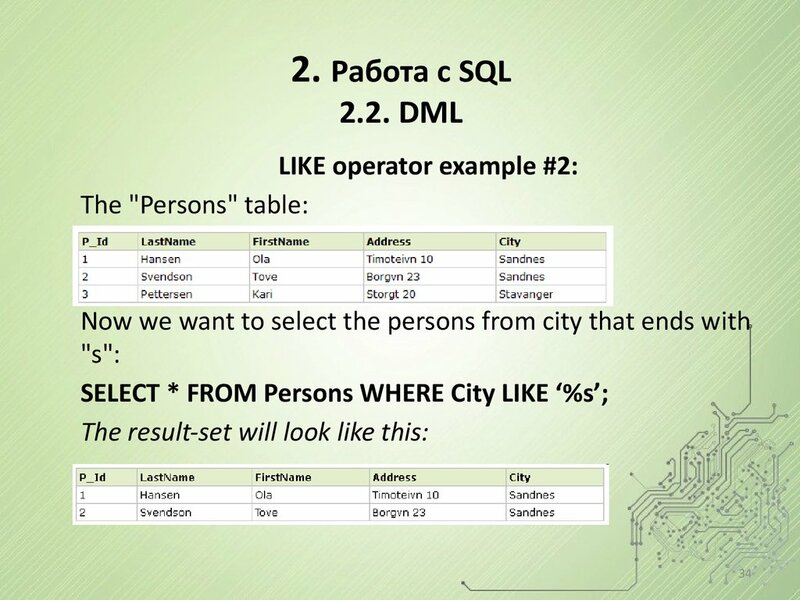 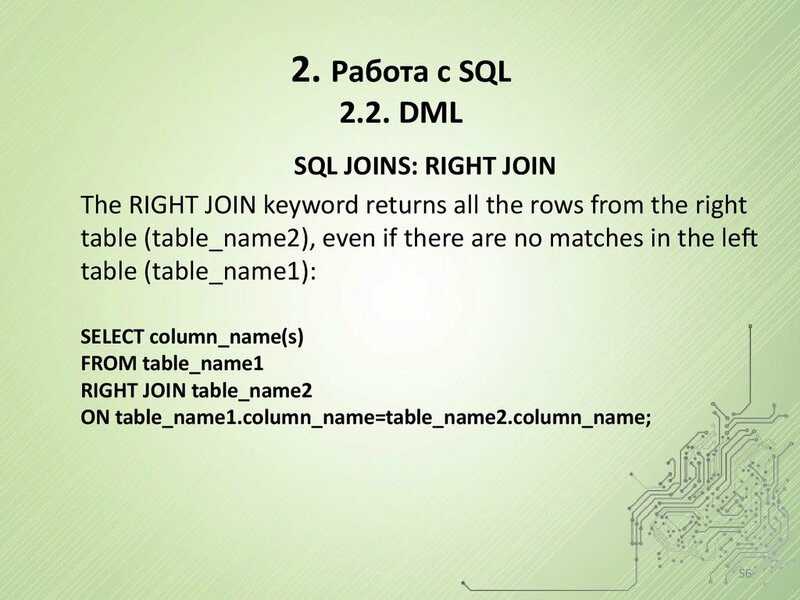 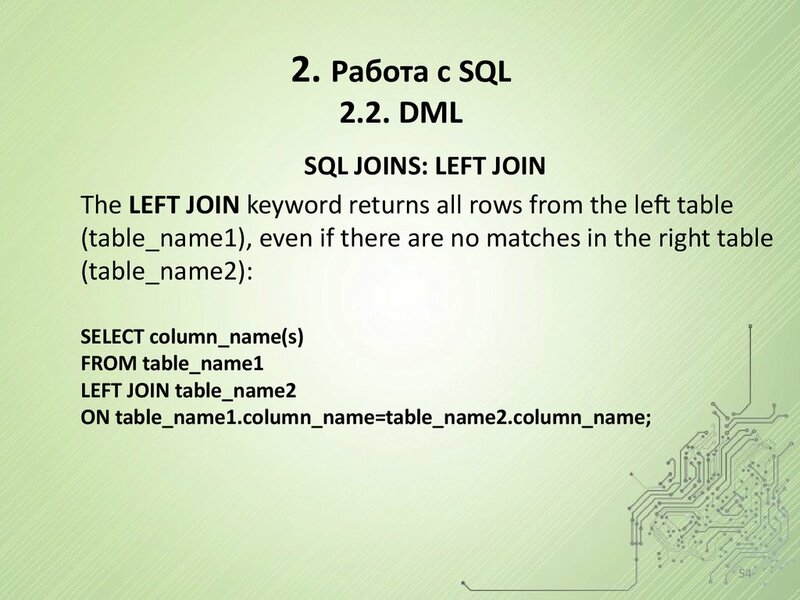 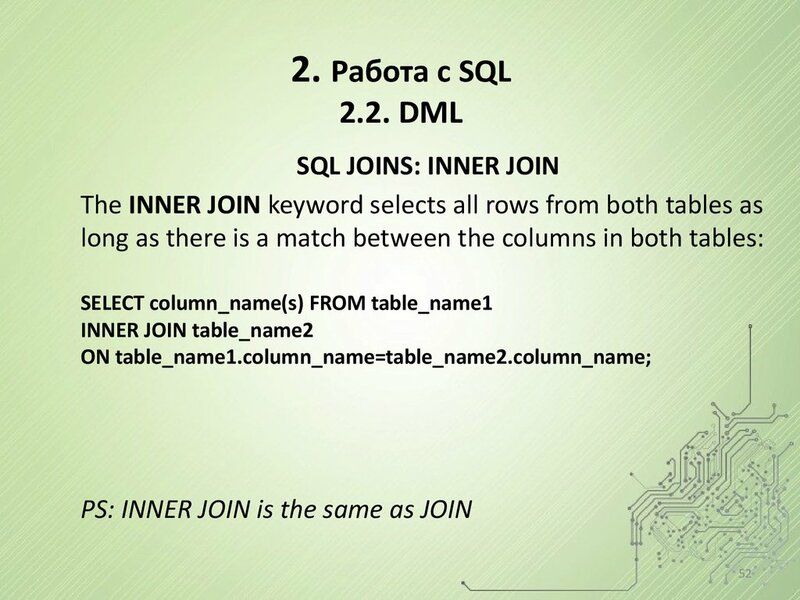 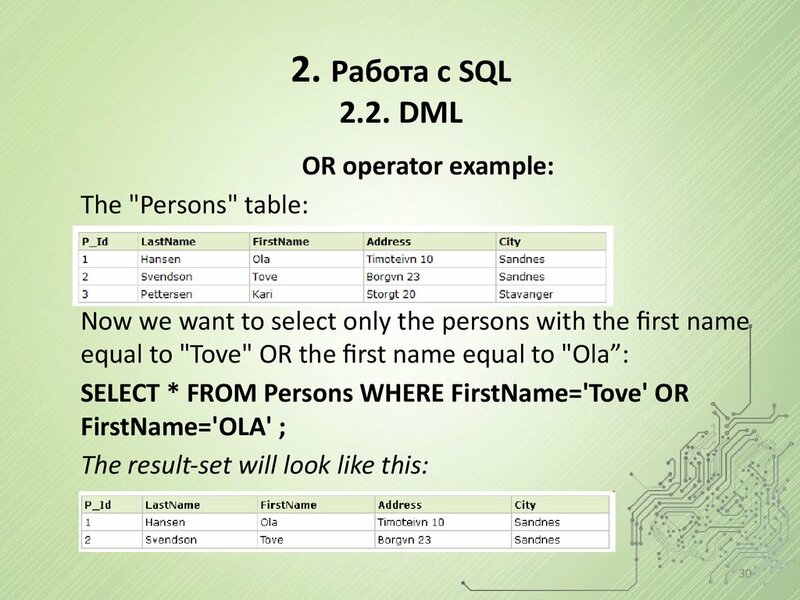 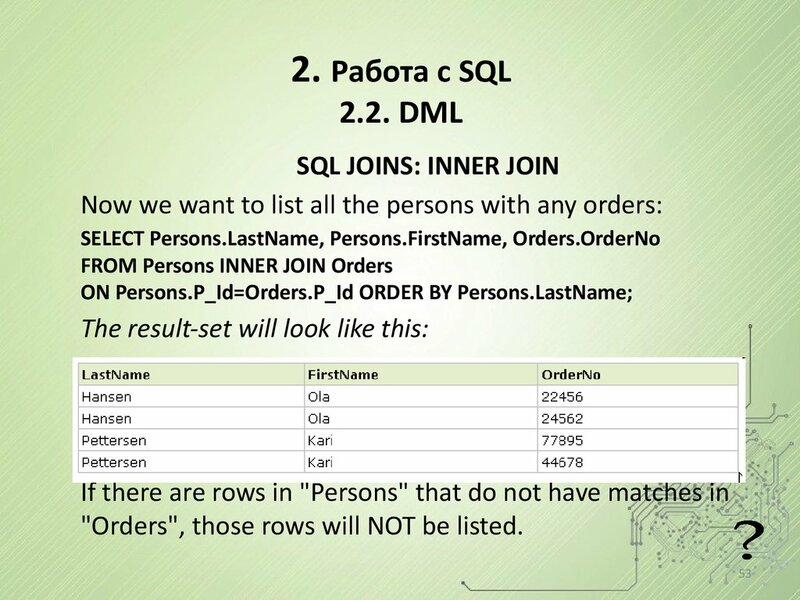 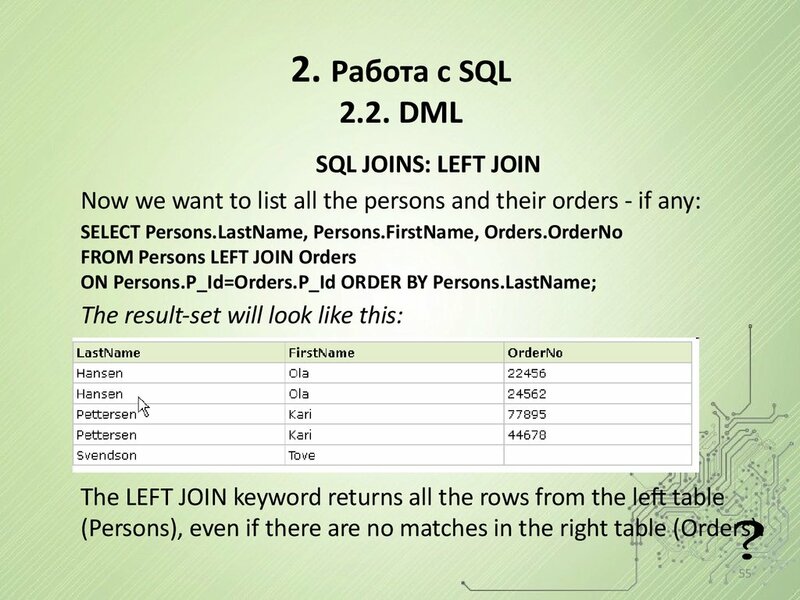 (Persons), even if there are no matches in the right table (Orders). 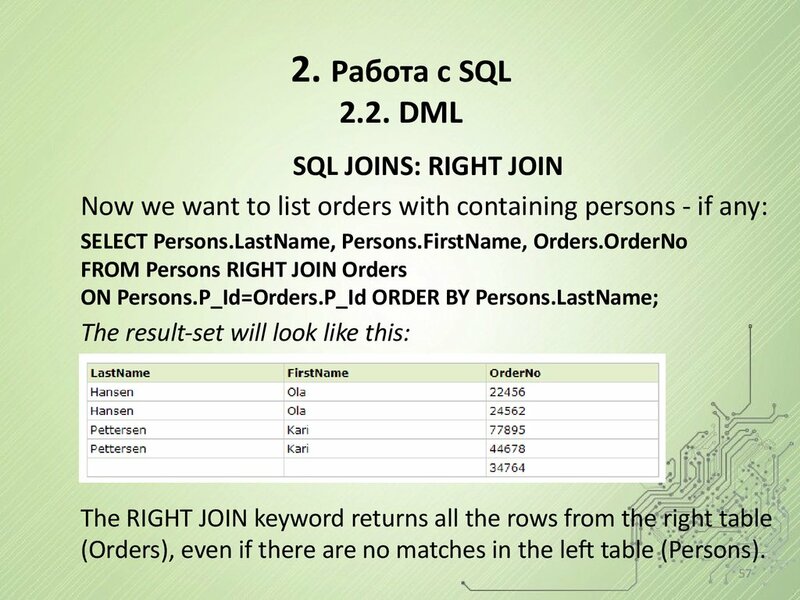 (Orders), even if there are no matches in the left table (Persons).